Bottarga is salted, cured fish roe and the technique of preparing it comes from the Italian island of Sardinia. It is traditionally sliced thin or ground and sprinkled on seafood pasta dishes. It may sound weird and stinky, but this unique condiment works surprisingly well. A little bottarga tossed with spaghetti and clam sauce or sprinkled over fresh beans instantly transports you to the seaside. Bottarga's flavor is the essence of the sea. It's fishy, but not in a bad way. It's also very briny from the salt. It's an excellent way to preserve large roes you find in a fish catch or buy at the market to ensure nothing goes to waste. Shad roe is a good one to use for bottarga, but the Sardinians use mullet or tuna roe. You could also use halibut, herring, flounder, white seabass, weakfish, or mackerel. You want small eggs, so skip the salmon and sturgeon. It's also important that you use a nice ripe roe. A ripe roe is one where you can see the eggs in the sac they come in. They should also be uniform in color. Overly watery roe is okay but it will take longer to cure. Unripened roe will not work. You must be able to see the eggs. If they are too small, do something else with the roe. 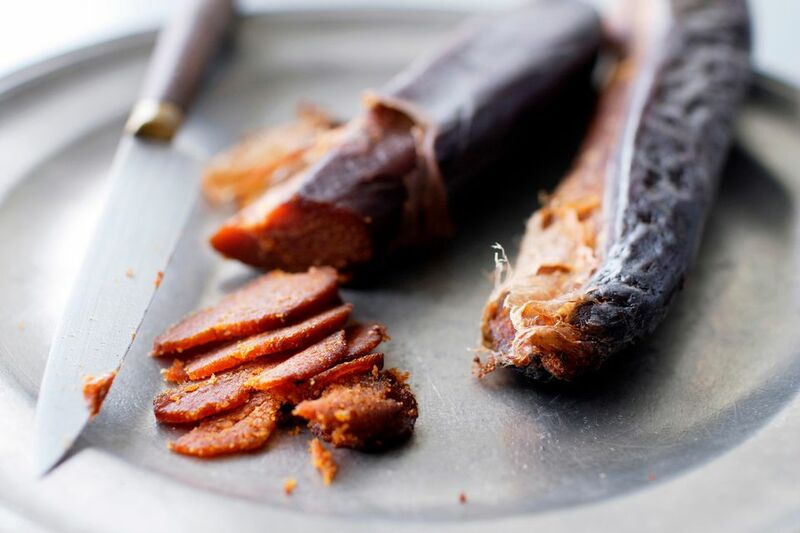 Making bottarga is not difficult, but it does take a good deal of patience. Remember that you are using this to preserve the roe over the long-term and it will take at least a couple of days. Though if you intend to grind it, it's best to begin weeks or even months in advance. To begin, gather your roe and soak them in salt water overnight. The next day, gather a board or cookie sheet, some olive oil, lots of salt, and plenty of paper towels. Lay paper towels out on the cookie sheet or board. Pat your roe dry with a paper towel. Toss the dried roe gently in olive oil to coat them, helping preserve their moisture. Once the roe​ is oiled, toss them gently in a bowl of salt to coat them evenly. Lay them down on a paper towel so they are not touching each other. Put the cookie sheet or board with the roe in a cool, dry place. It is not necessary to refrigerate them. The salt will pull moisture from the roe—and there's a lot of moisture in there—so you will need to replace the paper towels periodically and re-salt your roe. They need to always be coated with a thin layer of salt. After two to seven days, your roe will be ready and you will have bottarga. The earlier you use them, the softer they will be; early ones are crumbly and cannot be ground. Allow them to cure into hardness—the bottarga can sit for weeks or months—and you can grind them into a rough powder. Do not grind a piece of bottarga until you want to use it. Just like a spice, the flavor fades once it's ground. This makes an excellent pasta sprinkle. Store your finished, whole roe in a sealed plastic bag, vacuum seals them, or put them in a glass jar in the refrigerator or freezer until you want to use them. Bottarga will last a year or more stored this way.